This time of year I always start to see a huge variety of squash at the store. I love using butternut squash in soups and pasta, but I never seem to branch out much from there. When it comes to winter squash, I'm a bit boring. I was at the grocery store recently and decided it was high time to change my one track squash mind. I've heard about the flesh of spaghetti squash, how it pulls apart like thin strips of spaghetti when cooked, but had never made one myself. I decided to grab one, take it home and figure the rest out later. Well, one week later and that squash was still sitting on my counter staring back at me. I looked around for what else I had and thought I would do something with a bag of cubed sweet potato that was laying around. 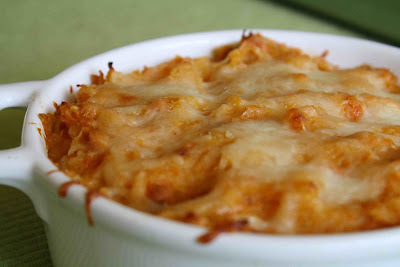 This Twice Baked Spaghetti Squash with Sweet Potato Puree is what ended up happening. I am definitely a new fan of spaghetti squash. If you're trying to keep things healthier you can definitely replace the cream with stock. I just happened to have the cream on hand and well, sometimes heavy cream just sounds like a really good idea. Cut spaghetti squash in half lengthwise. Drizzle the squash and the sweet potato cubes with olive oil and roast (cut side down for the squash) for 30 - 40 minutes until fork tender. Remove from the oven and let cool so you can handle the squash. Scoop the seeds out of the squash and run a fork along the flesh to remove the spaghetti-like threads. place the flesh in a bowl. Using a potato ricer, mash the sweet potato into the same bowl. Stir in the cheese and cream then salt to taste. Grease an oven proof casserole and place squash mixture in the casserole. Sprinkle more shredded cheese on top of the casserole. Bake for 20 minutes until the cheese is melted and browning slightly on the edges. Serve piping hot and enjoy! I love spaghetti squash but this recipe tops it all! This sounds the best! I will book mark this and try it out when I can find a nice spaghetti squash. Thanks. Sweet potato and spaghetti squash! I love it! Will be bookmarking! by the way...stop by over at my blog. There is something there for you! My mom used to make spaghetti squash when I was a kid and I loved it! This recipe sounds fabulous, I am going to have to surprise the family with it this week! That sounds really delicious! My mom used to make spaghetti squash when I was young and I haven't had it in such a long while - and I have never had it this way! Looks great! Wow, this sounds fantastic! I haven't had spaghetti squash in ages. It looks like I need to give it a try soon and try this recipe out. I bet my kids would even love this. It looks wonderful! What an interesting combo! The picture looks incredible. I'm also all for anything with sweet potato in it! What did you grease the baking pan with. Anonymous - I used canola cooking spray, but anyway you want to grease the pan would be just fine. Love, love, love spaghetti squash. This was a great change from how I usually cook it. Most importantly, it was a HIT at my dinner party. Keep them coming. I like how this dish incorporates so many flavors and veggies! I've only tried spaghetti squash once, but definitely need to try it like this now :). I would love to feature your recipe on our Demy, the first and only digital recipe reader. Please email sophiekiblogger@gmail.com if you're interested. I am finding SO many delish recipes on your blog so far. My mom loves coffee cake, and the little muffin idea looks BRILLIANT, I look fwd to baking these for Thanksgiving morning. Thank you thank you thank you.